Those funny few days between Christmas and New Year are the perfect time for a bit of reflection. I like to look back at everything I’ve been up to and where I’ve been, what (if anything!) I’ve learned and achieved in the last year and, most importantly, what I’ve been eating! So this post contains my absolute favourite recipes from this year and some of the best places I have visited. 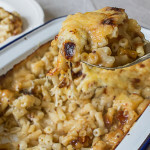 To cook up this take on macaroni cheese I made a beer bechamel; it turned out brilliantly and this is ideal for a cold winter night. Full of cheese, mustard and caramelised onions rounded off with flavourful beer. Recipe here. This was (and still is) one of the tastiest and quickest desserts I have ever made. 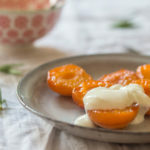 Perfect for using summer apricots and coupled with rosemary, honey and tangy crème fraîche it’s definitely worth a try! Recipe here. So much more than the sum of its simple ingredients, my easy white bean stew is ideal for using up a few old bits of veg and tins of beans in the cupboards. You can use it as a base for all sorts of things. Recipe here. These really are just the most delicious enchiladas I have ever tasted *blows own trumpet*. It’s really worth making your own enchilada sauce and spice mix for these. Recipe here. I’m not sure any more words are needed. Chocolate. Fudge. Cheesecake. Brownies. All of the best things in one hugely indulgent and delicious bake. Forget the January diet and get your oven on. Recipe here. Mixing up and steeping fruit in gin is something I am always experimenting with. This year I made quince gin for the first time so it was only right that I made a special cocktail to show it off. 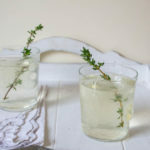 Quince gin, lime and thyme come together for this delicious refreshing drink. Recipe here. I only made these recently but I’ll certainly be making them again soon. The flaky pastry for these is so easy, I use a sneaky trick to make it work every time! They’re really versatile too so you can use up all sorts of leftover bits and bobs. Recipe here. I’ve had quite a few adventures this year and have been on a few travels. We took a minimoon in France to the Loire Valley and had the best time; and amazing food and wine! We also managed to shoehorn in a flying visit to Gothenburg in the autumn which was very cosy and got me so ready for winter. Below are my top three places in the UK I visited this year. I’ll be honest, I’d not heard of Cape Cornwall before I booked a hotel there so we could explore the Cornish coast. We were in just the right place at the right time to enjoy this sunset. The whole Cornish road trip was great and we crammed a lot into just a few days. Perfect for a quick getaway. See the full road trip here. As part of a trip to Essex we went to the charming Leigh-on-Sea which was full of independent shops, cafes and delis. We just went for the day but I could have spent much longer there! To see where we ate and what we got up to, the full post is here. Did you know that St Davids is the smallest city in the UK? What a place. A compact collection of shops, pubs, a pie shop built into someone’s garage and of course an impressive cathedral. What more do you need? What does 2017 have in store I hear you ask? I’m planning plenty of things for next year: more recipes of course (I’m hoping to do more baking), more foraging and cooking up with my wild ingredients, plenty more places to tick off my UNESCO list and I’m sure lots of delicious places to eat. You surely had a fun and delicious year, Caroline. Wishing you an amazing 2017! What a year, and married now as well!! Think you should have taken me on all of your adventures so I could chaperone you!! Your reflection food wise can be guilt free and full of delicious recipes. And I enjoyed all the holidays you took us along with. Happy New Year! What a fun year you’ve had! Thanks, Caroline, for your recipes, travel tips, and Huber,! Thanks especially for your tips for York and London. We had a great time exploring both – Betty’s in York was fantastic! We walked the walls, visited the minister at least four times, and simply enjoyed the beautiful streets of that city. And the lights on Regent Street and by Liberty in London were amazing! Happy new year – I hope it’s wonderful, flavorful, and full of great adventures! Looks like you have a year full of good food and interesting travel. I especially like the enchilada recipe- looks yummy an gooey! Happy New Year, Caroline! Here’s to a food and fun filled 2017 for both of us 😀 I seriously have to try that beer mac and cheese of yours…. serious yum!